On a cool, gray day when the calendar flipped to September, there was another sign of the start of fall in Arlington: the arrival of the ever-popular Pumpkin Spice Latte at at least some local Starbucks stores. The sugary, caffeinated beverage is as much a harbinger of fall as crunching twigs and acorns, plaid flannel shirts and brown boots. This year its potential Sept. 1 availability was cryptically teased by Starbucks on its social media accounts, though an official release date has yet to be announced. 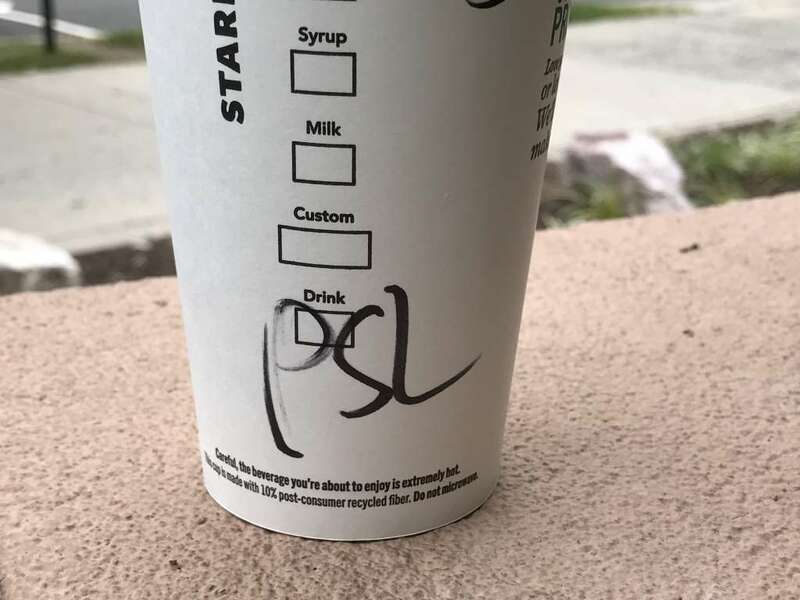 This morning at the Clarendon Starbucks store (2690 Clarendon Blvd), there were plenty of Starbucks customers who knew to ask for the “PSL” by name, despite a lack of signs or updated menus announcing its availability. And for those who asked for it, they received it. After successfully ordering a grande Pumpkin Spice Latte (and paying $5.57 with tax for the privilege), an ARLnow.com reporter asked the barista how many PSLs had been served so far that morning.